Experience education in the great outdoors. 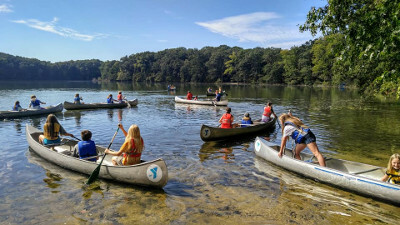 Located in a mature oak-pine forest and nestled in a secluded bay of Big Blue Lake, Pendalouan provides a 150-acre outdoor education center adjacent to the Manistee National Forest and the White River. Programs are available throughout the school year during autumn, winter, and spring. Camp Pendalouan strives to provide the best possible program for you and your students. With your participation, the time spent here at camp can be one of the most memorable parts of a student’s educational experience. Curriculum options include: environmental studies, living history, and teambuilding. Camp Pendalouan provides a variety of opportunities for school groups including Day Trips, Overnight Trips, and Teambuilding. Go beyond the four walls of the classroom and participate in the four-season outdoor classroom of Pendalouan. What better place than nature’s classroom. School groups can plan a day trip and experience Pendalouan’s environmental program. Any group can coordinate with our staff to plan an all-day program of activity-oriented Outdoor Education. We can provide a variety of indoor and outdoor settings and accommodate Day Groups of up to 360 people. Our staff are well-trained professionals who love kids and love teaching in the outdoors. Most classes are designed to run 1½ hours in length. We will work with you to select activities that are most appropriate and integrate best with your classroom curriculum. 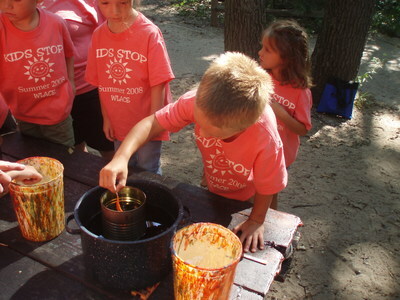 We provide hands-on learning in the areas of environmental studies, living history, outdoor skills, and team building. What better place than nature’s classroom. School groups can plan an overnight trip to experience Pendalouan’s in-depth environmental program. Any group can coordinate with our staff to plan a an overnight trip program of activity-oriented Outdoor Education. With fully heated and insulated cabins, we can provide comfortable accommodations for up to 180 people. Our staff are well-trained professionals who love kids and love teaching in the outdoors. Maximize classroom learning by eliminating social barriers that are often so disruptive! Observe as well as participate in a variety of group experiences led by our well-trained and seasoned staff. Socio-economic, racial, gender and other differences are forgotten as groups work together and process the experience. Schedule a teambuilding program at Pendalouan today! All team-building programs start with a group conversation and agreement to participate in the daily goals. Students are given an opportunity to warm up their brains and bodies through active play before convening in talking circles to review the day’s goals and expectations. 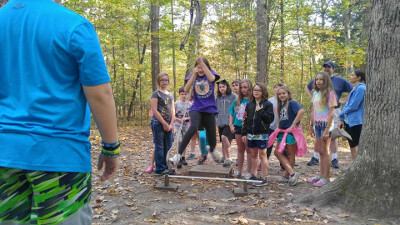 Participants move through a series of challenge initiatives on our athletic field before moving into the woods to tackle the low ropes course. Our instructors train participants in simple safety instructions before letting students move through the elements. "Just finished up fifth grade camp with my son's class from Muskegon Catholic Central. Everyone had such a great time! They are doing a great job up there with all of the activities! Can't wait to go back!"